Hello! Welcome to the final step of our kitchen renovation, the BLOG POST! lol While this was mostly a DIY project, it was all I could do to complete each step along the way, let alone photograph it all. This post is all about the final look, and sourcing the items. Keep reading to see lots of pretty pictures and to find out where I found everything! I'll also share DIY tips along the way! If you follow me on Instagram, I'm sure you have seen my 5 phases of kitchen renovation. We have lived in our spec home for 5 years now, and I have slowly done small projects over time to update the look of our builder grade finishes. Simple things like paint, wallpaper backsplash and relocating our island allowed us to have a pretty and functional space while we waited for the day we could really jump in to a new design. Here she was the day we moved in. Overall we removed the old cabinets, pantry and island. We installed new cabinets, lowers only, built in cabinetry around the fridge, built a new island with an additional 12 drawers and created a coffee and snack station where we now house our microwave. Even in removing our upper cabinets, we GAINED storage space! This is how our kitchen looks standing in our family room. By utilizing what was originally planed as the "eat in kitchen/dinette" we were able to double the feel of the size of the kitchen by extending the cabinetry to the other end and building the 8ft long island! Here is where we relocated our microwave to. These drawers hold coffee cups, coffee supplies and kids snacks. I also included a small lidded trash can for disposal of k-cups. We built the floating shelf using the plans from Shanty2Chic. We used white maple wood, which matches our butcher block island top. The backsplash is 4x8 white ceramic subway tiles from Wayfair with charcoal colored grout. The wall sconce is from Savoy House lighting. The ceiling pendants are from Lowe's, we had 2 hung during phase 4 of the kitchen remodel, but I always knew 3 would look best! The buffalo check bar stools are from Wayfair. The clock is from a local home decor boutique years ago. The Farmers Market sign propped up in the corner is from Home Goods. Here you can see the wall with our refrigerator, and built in cabinets. Previously we had a small pantry with bi-fold doors and it was difficult to properly store anything. We removed that as well as the framed in wall up to the ceiling to allow the installation of the fridge in the center with the floor to ceiling cabinetry around. The storage here is so much more functional. Behind each door are 2 pull out drawers and 2 adjustable shelves. All of the storage containers inside the cabinets are from IKEA. As we come around the corner to the cooking wall, you see where we replaced the microwave with the hood vent. The hood is from Wayfair. We also decided to go with a separate cook top and built in wall oven. This allowed us to expand the cooktop to 6 burners (36") without loosing cabinet space. It is also easier to keep clean as the counter top is solid all the way around. We added one additional floating shelf using the same method from Shanty2Chic. I installed the patterned tile, also purchased from Wayfair as a focal point. And the remainder of the backsplash is the continued white ceramic subway tile in 4x8 size (also Wayfair) with charcoal grout. We continued the same sconces as task lighting and I really love the uniqueness they provide. They are from Savoy House Lighting. The drawer pulls are from IKEA and they are a brass finish. Our cabinets are all stock, from IKEA. We chose the Leryhttan, the finish is black with a visible wood grain and a shaker style frame. We went with all drawer base cabinets, with the exception of the corner lazy susan and the tall cabinets around the refrigerator. In our previous kitchen we had 11 cabinets, upper and lower. In this new design, even with not replacing the uppers, we now have 32 drawers and door fronts! More storage and much better function within each cabinet! Our counter tops are quartz. We purchased them from a local factory in NE Ohio, Granex. They are mostly white with small gray veining, in a matte finish. The style name is the Edendale. I am very pleased with this selection as it is very easy to clean, requires no maintenance and is a bright contrast to the black cabinets. Oh the farmhouse sink. We decided to keep it simple and go with the double basin, top mount, apron front sink from IKEA. It's called the HAVSEN. It's new for IKEA this year. I love the price, I love the width, I'm glad to stick to double bowl. Our faucet is from Wayfair and I'm so glad we went with such a large piece. It's a little hard to tell in this photo, but we have about 16" behind our sink, where the window juts out. The large faucet fills that empty space well visually, and the high arch allows large pots to be easily filled. We went with a full pull out drawer under the sink and even with our plumbing and garbage disposal, I am able to fit 2 trash cans (helps with recycling) as well as my basket of cleaning supplies! Our kitchen island is now one of my favorite parts of this design. Previously, the small island blocked your path from the sink to the fridge and was too close to the stove. 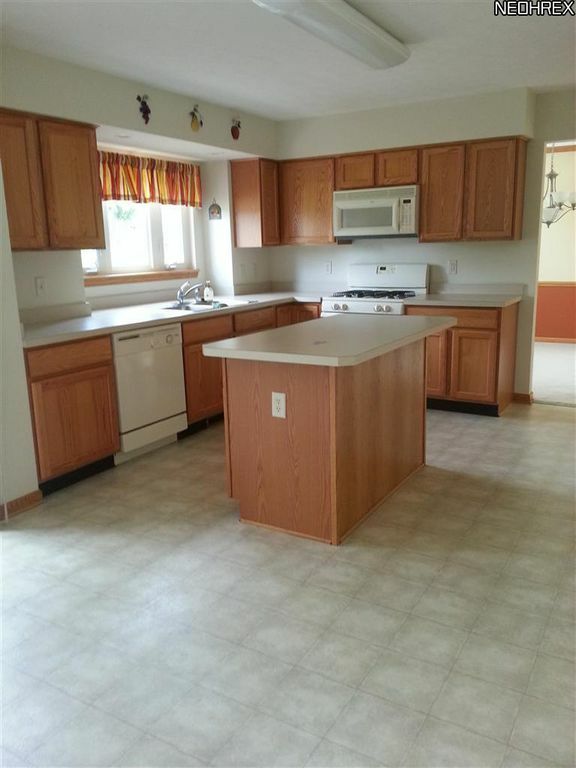 You could only access storage on one side and the counter top overhand was barely enough for 3 bar stools. It felt like a waste. We built the new island with 4 base drawer cabinets. Instead of the traditional 24" deep cabinet, we chose the 15" deep that IKEA offers. When they were assembled side by side, and back to back, it created an island base that was only 30" wide and I was able to move it further down the floor. Now I have a clear path from the fridge to the sink and plenty of space in front of the stove. We purchased a 8 foot long and 3 inch thick butcher block made of white maple from Country Moldings. They do offer shipping, but we are fortunate to live not quite 2 hours away, so we made the beautiful drive to bring this piece home. We attached it to the cabinet base and then onto two, 4x4" posts which we attached to our floor with hanger bolts. We added trim to the posts and had paint mixed to match our cabinet color. I love the additional 4 plus feet of overhang. We can comfortably sit 5 at that end and still have plenty of workspace at the other! We purchased a 8 foot long and 3 inch thick butcher block made of white maple from Country Moldings. They do offer shipping, but we are fortunate to live not quite 2 hours away, so we made the beautiful drive to bring this piece home. We attached it to the cabinet base and then onto two, 4x4" posts which we attached to our floor with hanger bolts. We added trim to the posts and had paint mixed to match our cabinet color. I love the additional 4 plus feet of overhang. We can comfortably sit 5 at that end and still have plenty of work space at the other! I hope I answered all of your questions, but if I missed anything, please leave a comment below or visit me on Instagram (@theothersideofneutral). I'll leave you with one more before and after! 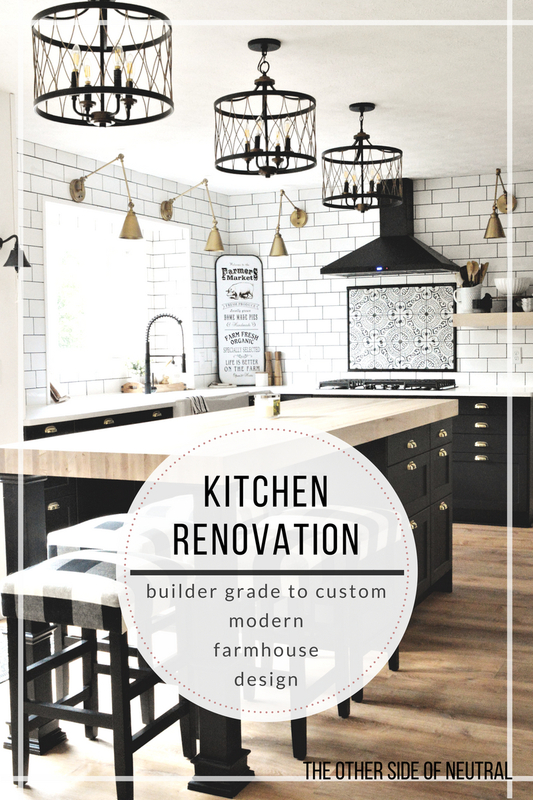 Thanks for joining me to see our builder grade kitchen turn into a custom, modern farmhouse design.